1. Try to find and use non-toxic, non-chemical, physical blocks. These use mineral blocks such as titanium dioxide or zinc oxide to block the sun as opposed to chemicals. Because they prevent UV rays from ever reaching the skin, these physical UV blockers offer the most effective protection. I like the Dr Hauschka line of sunscreens for both me and my kids. California Baby and Avalon Organics both have a good product too. 2. Look for both UVB and UVA broad-spectrum protection. It’s actually the UVB rays on a cloudy day that do the most damage to your skin and cause those pesky wrinkles. 4. Use a minimum of 30 SPF and apply liberally and often, especially after swimming (no duh, right?). Oh, and don’t forget to protect your peepers from the sun too! I couldn’t resist picking up these over-sized shades from local boutique Honeys and Heros for my daughter Gigi and her girlfriend Taylor. 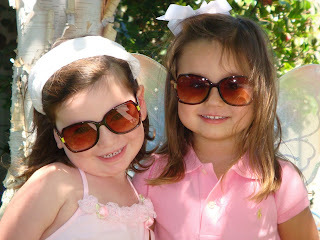 They were both so excited to have shades “just like mommy” it was too cute. As long as they aren’t carrying around tiny dogs and saying things like “You’re Hot!” I think we’ll be okay! These girls are so cute. Where can I get these glasses for my own girly girl?